Why Should You Wear An Air Pollution Mask? People who ride a bike absorb more dust particles when compared to the people who commute daily in a car. On a bike, you are exposed to the dangerous air pollutant which has a high content of nitrogen dioxide in it. In order to prevent getting any kind of infection that can be caused by the polluted air, using an air pollution mask seems like a smart move. The inhibitions and mindset of the people in India have brought them to a belief that the people who wear masks are already affected by a deadly virus of some sort. Moreover, the mythical land of India also avoids precaution. In order to avoid getting the extra conscious attention from the bystanders. However, people in Asian countries really need to start using air pollution masks because there is a consistent rise of toxic air which has also increased the fear of getting contagious diseases. Air pollution is constantly threatening us with many health ailments. At times, they are life-threatening as well. One of the reasons why doctors advise wearing air filtration masks (also termed respirators) is to avoid breathing in contaminated oxygen. The air which you breathe is highly contaminated with harmful pollutants. The likes of particulate matter, sulfur dioxide, and carbon monoxide can be found in abundance in the everyday air that we breathe. Wearing a face mask is not to set a fashion statement. It is to prevent yourself from getting deadly airborne diseases. Wearing a mask in hot and humid climate might not be the most comfortable things to do. However, one needs to keep in mind that he/she can be the reason for the unintentional rise of infection around them. When should you be wearing a pollution face mask? Since pollution is a global problem, most countries are declaring a war against it. Every country has started keeping a track of Air Quality Index, commonly known as AQI. Depending on the score of AQI, an individual must wear the respirators. The System of Air Quality and Weather Forecasting and Research (SAFAR) suggest that respirable pollutants PM 2.5. And PM 10 should be at 60 and 100 respectively. In National Capital of India, it is at 999 according to the recent WHO survey. Anything higher than the suggested figure of PM 2.5 and 10 means the particulate matter is implanting in your lungs. Moreover, making its way to your bloodstream. Whenever you step out of your house or workplace, wear an air pollution mask. In May 2018, high-velocity dust storm created a havoc in north India. 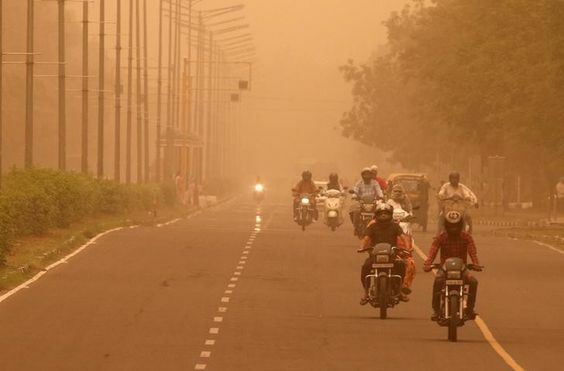 Cities like Gurugram, and New Delhi along with the cities in Uttar Pradesh and Rajasthan were highly affected by the aftermath of sandstorm and bad weather. Due to this disaster, it was unbearable to breathe with many harmful air pollutant and dust particles gone loose. In times like these, it is highly advised to stay inside. As haze and dust storm can become a common occurrence. In case of emergencies, wearing a pollution mask to protect yourself from the exposure to dangerous air pollutants that lead to lung and heart disease is advisable. One should also keep in mind that wearing an air mask is a must when they are sick. Germs travel through the air quite easily and can immediately affect your loved ones if not kept in check. When we fall sick or have a cough and cold, even a tiny droplet of saliva and mucus can carry an airborne virus which is exhaled into the air. A properly worn mask protects the people. Living in the vicinity from receiving any kind of infection and other harmful germs. Either way, staying healthy is important. Which is why it is highly recommended to wear an air purifying mask whenever you step out. Did you find the blog useful? If you have anything else to add or suggest, please write to us in the comment section. Also Read Main Causes of Air Pollution in Delhi. Thanks for pointing out how wearing an air pollution air mask will help users avoid the dangers of highly contaminated air with harmful pollutants. My son lives in a heavily congested city, and he goes to work on his motorcycle. I will be sure to advise him to start wearing air pollution masks to work so that he can keep his respiratory health in top condition.